But the brightest and best placed comet for morning viewing is currently Comet C/2013 R1 Lovejoy. Shining at +6th magnitude, R1 Lovejoy just passed into the constellation Leo after a photogenic pass near the Beehive Cluster (M44) in Cancer last week. We caught sight of R1 Lovejoy a few mornings ago, and it’s an easy binocular object, looking like a fuzzy unresolved globular cluster with barely the hint of a tail. If the name sounds familiar, that’s because the comet was discovered by Australian observer Terry Lovejoy, the prolific discoverer of four comets, including the brilliant sungrazing Comet C/2011 W3 Lovejoy that survived its 140,000 kilometre perihelion passage above the surface of the Sun on December 16th and went on to dazzle southern hemisphere observers in late 2011 and early 2012. Comet R1 Lovejoy as imaged by Rob Sparks (@HalfAstro) from Tucson, Arizona passing near the Beehive cluster. (Credit: Rob Sparks). Terry discovered R1 Lovejoy on September 7th, 2013 while it was still at magnitude +14.4. The comet is expected to top out at +4th magnitude in late November as it passes 61.4 million kilometres from Earth on November 19th and heads for perihelion at 0.877 AUs from the Sun on December 25nd, 2013. Comet R1 Lovejoy is on a 64 degree orbit highly inclined to the ecliptic, and has a period roughly 7,000 years long. The last time R1 Lovejoy graced Earthly skies, our early ancestors still thought copper smelting was a pretty hip idea! The orbital path of Comet R1 Lovejoy through the inner solar system. (Credit: NASA/JPL Solar System Dynamics explorer). And unlike comets Encke and ISON that are plunging near the Sun, Comet R1 Lovejoy never gets closer than 19 degrees elongation from our nearest star in late December. It also reaches a maximum northern declination of 43 degrees on November 28th, the same day that ISON reaches perihelion. For mid-latitude northern hemisphere observers, R1 Lovejoy will remain well placed at 35 to 45 degrees above the northeastern horizon about an hour before sunrise through late November. November 11th: Passes near +4.5 Kappa Leonis. November 14th: Passes from Leo into the constellation Leo Minor & passes near the +5.3 star 20 Leonis Minoris. November 16th: Passes near the +5th magnitude stars 28, 30, and 34 Leonis Minoris. November 18th: Passes into the constellation Ursa Major. November 19th: Passes near the +4.8 magnitude star 55 Ursae Majoris & +5.3 magnitude star 57 Ursae Majoris. November 19th: Closest to Earth, at 0.4 AUs distant. The celestial path of Comet R1 Lovejoy spanning November 11th to the 30th. (Created using Starry Night Education software). November 21st: Passes into the constellation Canes Venatici. November 22nd: Passes near the +6th magnitude star 4 Canum Venaticorum & the +4.2 magnitude star Chara (Beta Canum Venaticorum). November 24th: Passes near the Sunflower Galaxy (M63). November 27th: Passes into the constellation Boötes. December 1st: Passes near +3.5 magnitude star Nekkar (Beta Boötis). December 4th: crosses into Corona Borealis. Note that passes on the list above denote passages closer than one degree of Comet R1 Lovejoy near bright objects. Perihelion for the comet is December 25th at 0.877 AU, and its closest approach to Earth is November 19th. On this date, it will also be moving at its maximum apparent speed as seen from Earth, covering about 3 degrees of the sky every 24 hours, or the angular span of the Full Moon every 4 hours. Comet R1 Lovejoy as imaged by Pete Lawrence on November 9th. (Credit: Pete Lawrence). It’s worth noting that all four of these morning comets are on separate orbital paths, and only seem to be in the same general region of the sky as seen from our Earthly vantage point… and none of them are passing near the Earth! This week is also a good time to hunt for comets in the pre-dawn sky for another reason: the Moon reaches Full this coming weekend on Sunday, November 17th. After this week, it will start to creep into the morning sky and interfere with deep sky observations for the next two weeks. Comet R1 Lovejoy imaged on November 10th by astrophtographer Justin Ng. (Credit: Justin Ng). It’s also interesting to note that amateur observers discovered two more faint comets this past weekend. Though comets C/2013 V3 Nevski and C/2013 V2 Borisov aren’t slated to be anything spectacular, that brings the number of amateur discoveries to 13 for 2013. Are amateur comet hunters mounting a comeback? In this age of automated surveys, the question is often raised as to whether amateurs can still discover comets. Keep in mind, Terry Lovejoy found Comet R1 Lovejoy with a medium-sized 8-inch Schmidt Cassegrain reflecting telescope… the age of amateur comet hunters seemes far from over in 2013! While many are anticipating seeing Comet ISON, there’s more in the sky these days than just one comet. There are actually four comets now in the skies in the mornings — in addition to ISON, there’s comets 2013 R1 Lovejoy, 2P/Encke and 2012 X1 LINEAR! Unfortunately, none of these are visible to the naked eye — yet anyway. 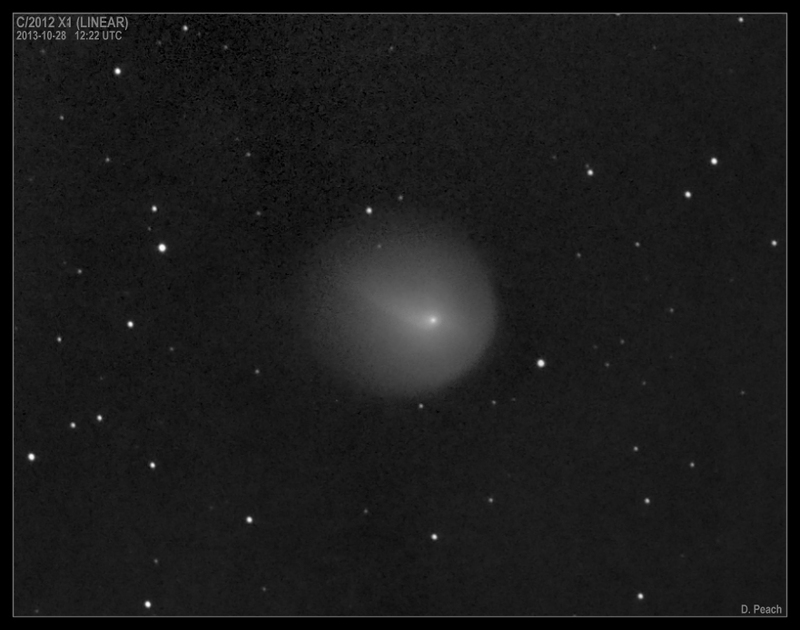 Comet 2P/Encke on October 30, 2013. The coma is partially obscuring the small barred spiral galaxy NGC 4371. Credit and copyright: Damian Peach. A gorgeous shot of Comet Encke by Damian Peach. “The fine narrow ion tail is very nicely defined which has recently developed,” Damian said via email. Comet 2013 R1 Lovejoy on Oct 31, 2013. Credit and copyright: Damian Peach. Journey of Comet ISON on 27 October 2013 from Justin Ng Photo on Vimeo. Short Animation of Comet ISON – C/2012 S1 from NOVALAPSE Timelapse Recordings on Vimeo. Procyon and Comet Lovejoy in the morning sky on October 31, 2013, from Arizona. Credit and copyright: Robert Sparks. If you want to try and see these comets for yourself (good astronomy equipment needed) check out our article on how to see these four morning comets. Get your astronomical trick-or-treat bags ready. An excursion under the Halloween morning sky will allow you fill it in a hurry — with comets! We’ve known for months that ISON and 2P/Encke would flick their tails in the October dawn, but no one could predict they’d be joined by Terry Lovejoy’s recent comet discovery, C/2013 R1 (Lovejoy), and the obscure C/2012 X1 (LINEAR). The last surprised all of us when it suddenly brightened by more than 200 times in a matter of days. Almost overnight, a comet found on precious few observing lists became bright enough to see in binoculars. Now comet watchers the world over are losing sleep to get a glimpse of it. Since it’s unusual to have four relatively bright comets in the same chunk of sky at the same time, you don’t want to miss this opportunity. Now that the moon has dwindled to the slightest crescent, this is THE time to hunt for these ghostly apparitions before dawn. Brightest of the bunch at magnitude 8 and your best bet to see in a standard pair of 50mm binoculars is Comet Lovejoy. Using the maps, look for a round, fuzzy spot with a brighter center not far from the bright star Procyon in Canis Minor. In the coming days, Lovejoy will brighten by an additional 2 to 3 magnitudes as it trucks across Cancer headed toward the Big Dipper. This is one to watch. Lovejoy will likely reach naked eye brightness by mid-November. Small telescope users can see the comet with ease but its developing gas tail is still to faint to spot visually. Comet Encke drops below Leo and into Virgo over the next two weeks. Your guide star Beta Leo is at upper right. Stars to mag.8. Click to enlarge. Comet Encke treks around the sun every 3.3 years. Sometimes it’s well placed for viewing and sometimes not. Because of its short period, dedicated comet watchers meet up with it a half dozen or more times during their lives. This apparition is a favorable one with the comet well-positioned in the east at dawn near peak brightness. Current estimates place it magnitude 7.5-8 with only the wispiest of tails. Like Lovejoy, 50mm binoculars under a dark sky should nab it. A week before Encke reaches its peak magnitude of 6 or 7 at perihelion on Nov. 21, it chases the into the glare of morning twilight. If you want to see this comet, you’ve got about 2 weeks of viewing time left. Make sure to set up in a place with an open view to the east-southeast or you’ll find it hidden by the treeline. Comet C/2012 X1 would have deprived us of a unique sight had it followed the rules. Instead, an eruption of fresh, dust-laden ices from its surface blasted into space to form a gigantic glowing sphere of material that vaulted the comet’s magnitude from a wimpy 13.5 to a vol-luminous 7.5. That’s a difference of 6 magnitudes or a brightness factor of 250 times! 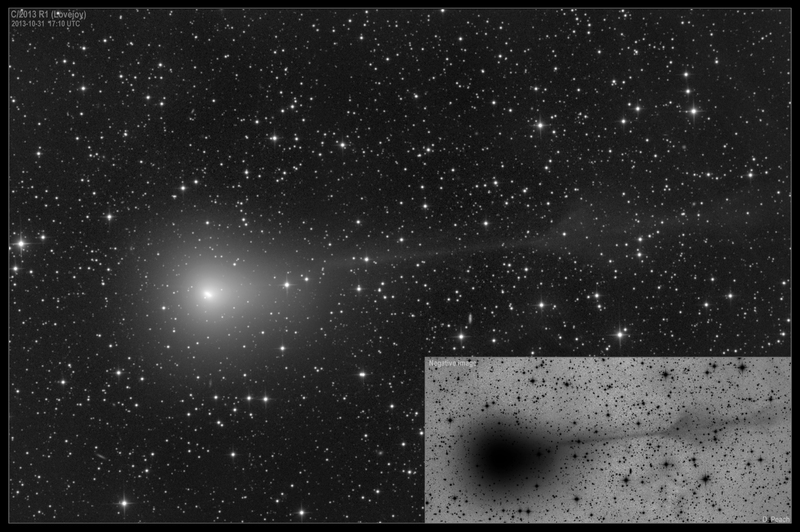 Outbursts of this consequence are rare; the best example of a similar blow-out happened in 2007 when Comet 17P/Holmes cut loose and brightened by half a million times from magnitude 17 to 2.8 in just under two days. C/2012 X1 (LINEAR) hovers low in the northeast in Coma Berenices near Beta. Because it’s much further from Earth than the other three comets, it moves more slowly across the sky. It has a close conjunction with the brilliant star Arcturus in mid-November. In this map, north is at top left and west to top right. Stars to mag. 8. Click to enlarge. As with any explosion, the cloud of debris around C/2012 X1 continues to expand. Presently measuring a healthy ~8 arc minutes in diameter (1/4 the size of the full moon), the comet will almost certainly continue to grow and fade with time. Catch it now with binoculars and small telescopes before its veil-like coma thins to invisibility. Like Encke, X1 LINEAR requires an open eastern horizon and best viewed at the start of dawn. Make it the last comet on your observing list after Lovejoy, Encke and ISON. Mars and several other moderately bright stars in Leo will guide you to Comet ISON in the next week or two. Stars to mag. 10. Click to enlarge. Ah, ISON. Halloween morning wouldn’t be complete without a visit to this year’s the most anticipated comet.. If it can hold itself together after a searing graze of the sun on November 28, the comet will undoubtedly become a most pleasing sight during the first three weeks of December. Right now it’s a little behind schedule on brightness, but don’t let that worry you – its best days are still ahead. One of the finest pictures to date of Comet ISON by ace astrophotographer Damian Peach taken on Oct. 27. Of our four morning treats, Comet ISON is currently the faintest at around magnitude 9.5. Observers with binoculars in the 70-100mm range will see it under dark skies but most of us will need a 6-inch or larger scope at least until mid-November. That’s when ISON’s expected to brighten to magnitude 6, the naked eye limit. Just before it slips into the solar glare, ISON could reach 3rd magnitude around Nov. 21, normally an easy catch with the naked eye, but low altitude will hamper the view. So open your bag wide tomorrow before dawn and keep it open the next few mornings. Trick or treat! Astrophotographers were out in full force this weekend to try and capture the bonanza of comets now visible in the early morning skies! You’ll need a good-sized telescope to see these comets for yourself, however, but with the Moon now waning means darker skies and better observing conditions. Above is an absolutely gorgeous image of Comet ISON taken by Damian Peach. 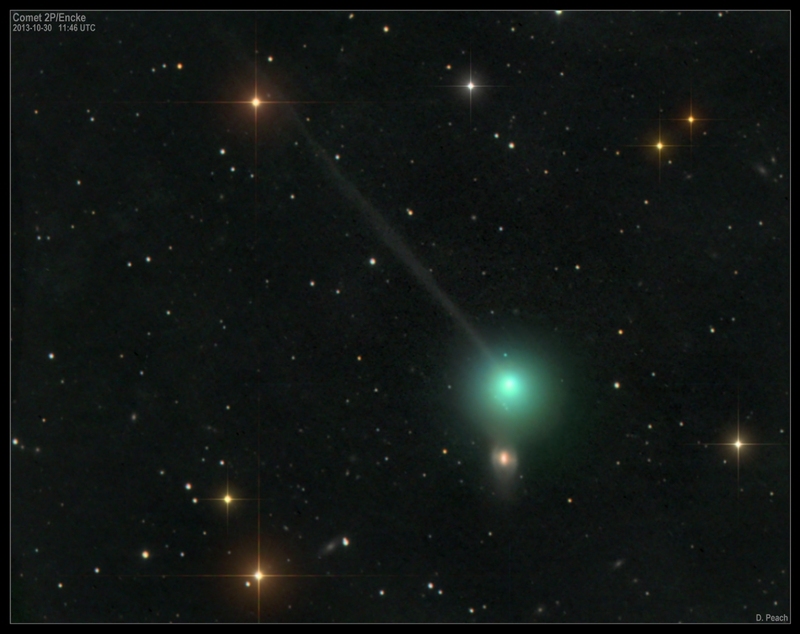 See below for more images of not only Comet ISON, but also Comet Encke, Comet Lovejoy and Comet LINEAR — now in outburst. In fact, one of our “regular” contributors, John Chumack, captured all four comets in one morning, on Saturday October 26! Four comets captured in one morning! Clockwise from top left: Comet ISON 2012 S1; Lovejoy C/2103 R1;, 2P ENCKE, Linear 2012 X1. Credit and copyright: John Chumack/Galactic Images. Here’s a view from a smaller telescope from Tom Wildoner, to give a better idea of what “most of us” would see with our humbler telescopes! The view of Mars and Comet ISON on the morning of October 28, 2013. taken using a 75mm lens, 30 seconds at ISO 800. Look for the small blur inside the yellow circle. Credit and copyright: Tom Wildoner. Comet 2012 1X (LINEAR) on October 28, 2013 following its recent outburst. Obtained under bright twilight, low altitude and moonlight! Credit and copyright: Damian Peach. Comet ISON Nucleus on October 26, 2013 at 9:43 – 10:27 U.T. Taken with QHY8 CCD & Homemade 16″ Newtonian telescope. A total of 40 minutes of exposure (20 x 120 second exposures). Credit and copyright: John Chumack/Galactic Images. In the early morning of Oct. 25 (6:45 a.m. EDT), NASA’s Marshall Space Flight Center in Huntsville, Ala., used a 14″ telescope to capture this image of Comet C/2012 S1 (ISON), which is brightening as it approaches the sun. The comet shines with a faint green color just to the left of center. The diagonal streak right of center was caused by the Italian SkyMed-2 satellite passing though the field of view. At magnitude 8.5, the comet is still too faint for the unaided eye or small binoculars, but it’s an easy target in a small telescope. At this time of this image, ISON was located in the constellation of Leo the Lion, some 132 million miles from Earth and heading in toward the sun at 87,900 miles per hour. If you want to try and see some of these comets for yourself, see our recent “explainers” of how to see Comet 2012 1X LINEAR, Comet 2P (Encke), Comet 2011 W3 (Lovejoy), and the big one, Comet ISON. Just in from the pretty pictures department: Award-winning Astrophotographer Damian Peach from the UK took this gorgeous image this morning of Comet C/2012 V2 LINEAR passing by bright spiral galaxy NGC 2997. While the cosmic duo looks like they are right next to each other, Damian notes that in reality, the comet is 17 light minutes away from Earth while NGC 2997 is 38 million light years away. The specs: 0.11m F5.6 with STL-11k. LRGB. L: 5x3mins. RGB: 1x2mins. Check out more of Damian’s fantastic collection of images at his website or Facebook page.